Zuky @ BookBum was so kind to nominate me for the Mystery Blogger Award. Thank you, Zuky! I recommend checking out her lovely blog. And if you’d like to read her responses to the nomination, you can check it out here. 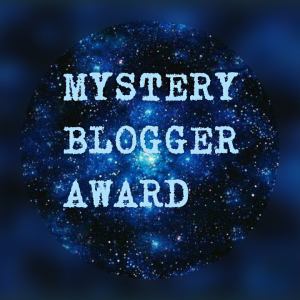 The Mystery Blogger Award was created by Okoto Enigma. I enjoying doing community service and volunteering. I’m convinced my dog sneezes directly in my face on purpose because he knows I’ll always love him and can never stay made at him for more than a second. Sometimes it is funny when he does that. It’s a tie between monkeys and wolves. Hmm, that’s a toss up between heights and spiders. If the costumed characters at a Disney park count as celebrities, then yes I have….But no, I haven’t. An author. Or professional athlete (track or basketball), performer on Broadway, an animator, or choreographer. Share the link to your best/favourite post of yours. >>> Blog Milestone: 100+ Followers! Haha Dogs (and animals in general) can be so funny. They’re just like people in that way. You’re welcome! Can’t wait to read your post for it. And I agree with you about dogs/animals. My dog thinks he’s a person and king of the house. Lol they steal our food and run away which is annoying but they never hurt us so oh well! LOL! I think that’s true of all dogs! My yorkie hates when my husband lays next to me in bed. He insists on squeezing himself right between us, and frequently turns to sneeze right in my husbands face.